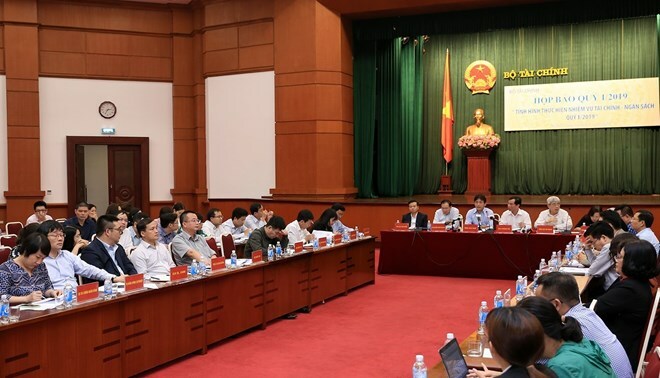 Hanoi (VNA) – The Ministry of Finance (MoF) has announced the outcomes of the implementation of financial and budgetary tasks in the first quarter of 2019, noting that there was a state budget surplus during this period. At a press conference on April 5, the MoF reported that total state budget revenue reached 381 trillion VND (over 16.4 billion USD) during the last three months, equivalent to 27 percent of the targeted figure for this year – higher than the 23 percent of annual targeted revenue achieved during the same period last year. That sum included 315.4 trillion VND gained from domestic sources, up 13.8 percent year-on-year, the ministry said, adding that 49 of the 63 provinces and centrally-run cities had revenues from domestic sources equivalent to over 24 percent of their estimates for this year. Fifty-four localities reported year-on-year increases in their Q1 revenues. Meanwhile, the state budget spending during the period surpassed 315 trillion VND, equivalent to 19.3 percent of this year’s spending estimate. The MoF said spending tasks have been performed in line with the set plans, ensuring social security. As the spending demand in Q1 was low, there was a budget surplus. Several economic experts held that the restructuring of the state budget has resulted in positive outcomes. Revenues from unstable sources decreased in the three months, including that from crude oil (12.28 trillion VND – down 14.3 percent year-on-year). Assoc. Prof. Le Xuan Truong, Dean of the Taxation and Customs Faculty at the Academy of Finance, said the structure of state budget revenue has become steadier in recent years. Revenue from domestic sources has been rising fast, accounting for 82 percent of the total state budget revenue in 2018. However, he also pointed out the unsustainability of the state budget revenue structure for many localities, noting that their budget collection still mainly depends on land-related revenue – an unsustainable source – while contributions from production and business activities have failed to reach the set targets. The MoF also admitted some big problems such as tax losses, late tax payment, and transfer pricing, which will require the financial sector to tighten control to ensure stable revenue and fair tax collection among businesses. Truong said authorised agencies should prioritise creating an optimal environment for production and business so as to consolidate the foundation for state budget collection. In the long term, it is necessary to press on with economic restructuring towards capitalising on Vietnam’s advantages, as well as to promote enterprise participation in stages with high added value in global value chains, thus improving their operational efficiency and the economy’s competiveness.